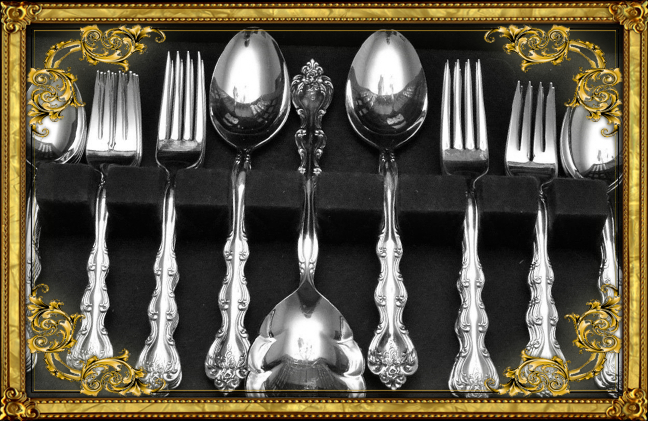 Sterling silver and coin silver flatware & silverware can be quite valuable. Most pieces are easy to identify by looking on the handle of the silverware or the bottom of the flatware, they will usually be marked sterling, 925, 800, 900, with a makers mark like a crown or lion with his paw raised facing the left, but not all are easy to find nor are they marked. There are many popular brands that have desirable patterns examples :Tiffany & Co., Gorham, Reed & Barton, Revere, International silver, Towle, Wallace, Lunt, Oneida, Shreve and many many more. The knife handles are made of silver on these sets but the knife blade is not going to be silver and the handles are filed with clay or resin of some sort.